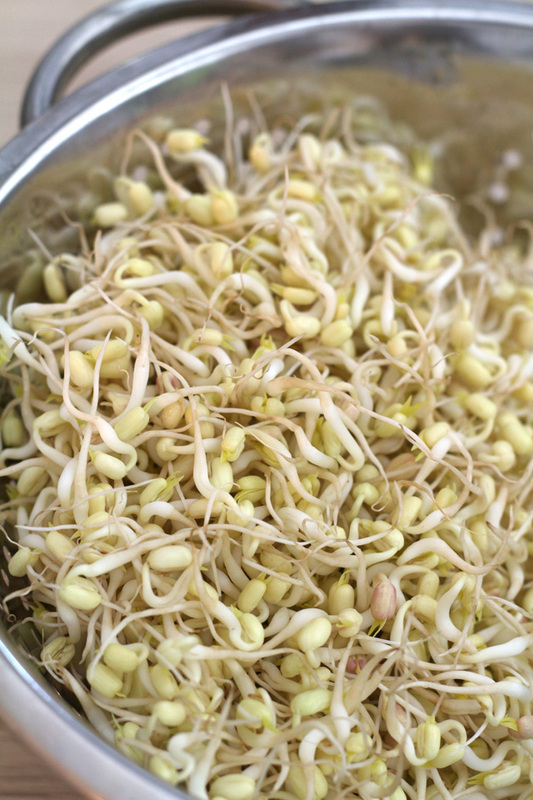 Sometimes a dish I’de like to cook would need Mung bean sprouts, which for some, might not be a problem. But since I moved here in Germany, I have to, either, settle for the bottled ones, which I find awful (limp and taste totally different). Or option #2…drive 30 kilometers to get them fresh(ish) from the nearest Asian store from our place (if they have it). Faced with these options, I usually end up skipping it or not cooking the dish altogether. Like for the longest time, I have been planning to make Lumpiang Togue (Mung bean sprouts Spring rolls) but every time we schedule a trip to the Asian shop, I either forget about it already or they do not have them. But now, I learned about option #3 from an article in Serious Eats by KUMIKO MITARAI …and is for me so much practical, easy and fun! I now grow my own Mung bean sprouts!!! And it usually takes only 3-4 days! 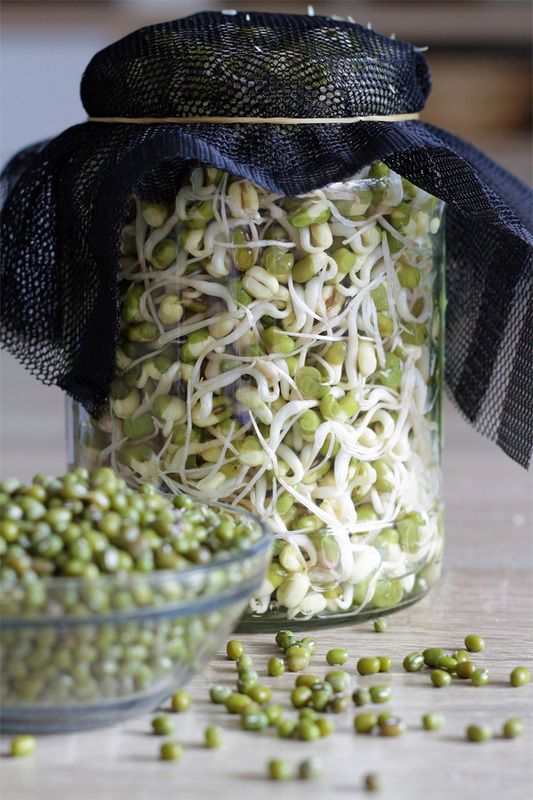 Fresh, crisp (and for sure, clean) Mung bean sprouts any time and as much as I want or need! 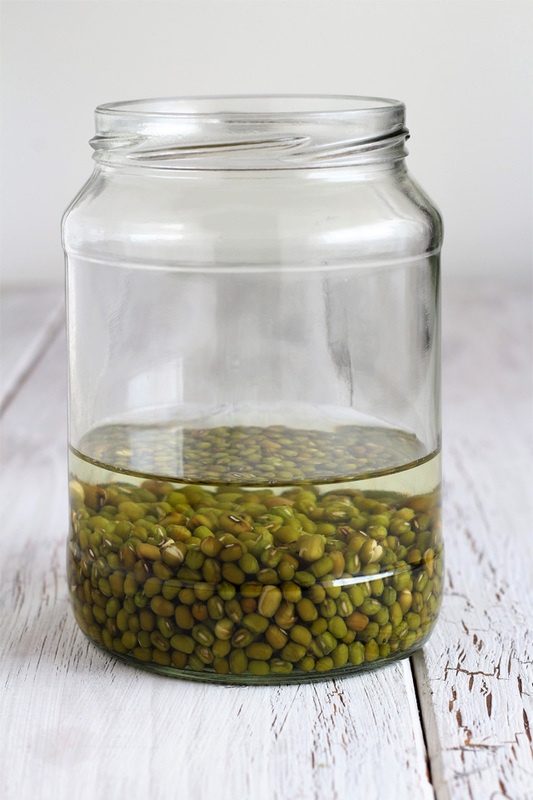 Mung beans enough to fill about a quarter of your jar. 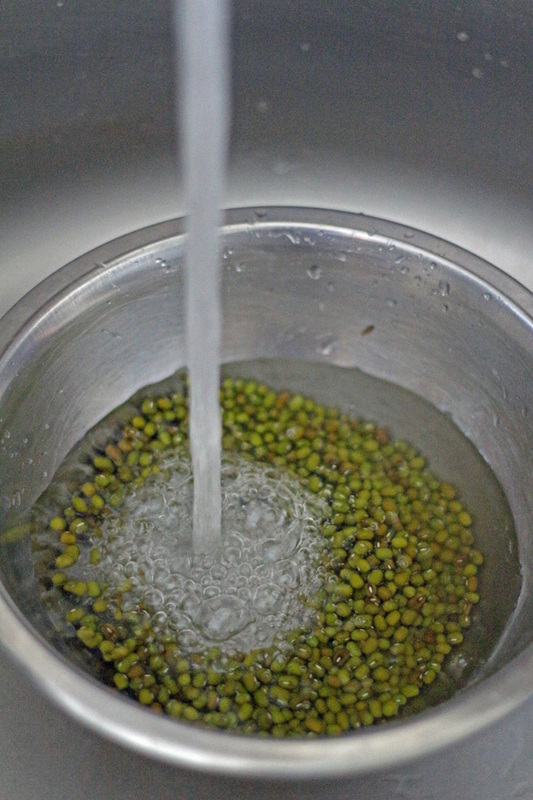 Wash and rinse the mung beans thoroughly for several times until water becomes clear. Soak for at least 2 hours until they expand a bit and skins start to break. Cover top with mesh cloth and rubber band and drain the water through it. Turn the jar upside down and place it on top of the turned jar cover in a tilted position. This is to let excess water run out and allow air in. Place them in a dark place like in a cupboard or cabinet under the sink. If you started in the morning then in the afternoon or before your sleep, run water through the mesh and drain it again and put it back in its place. Do this at least two times a day for three days. On the second day, you will see roots are starting to come out. 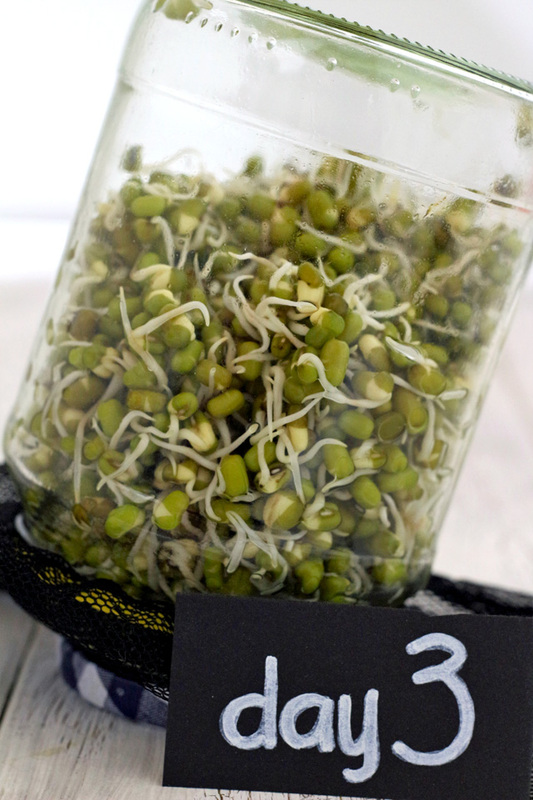 The sprouts are ready and can already be eaten on the third day, depending on what are you using them for. Wait another day and they will be about an inch long. 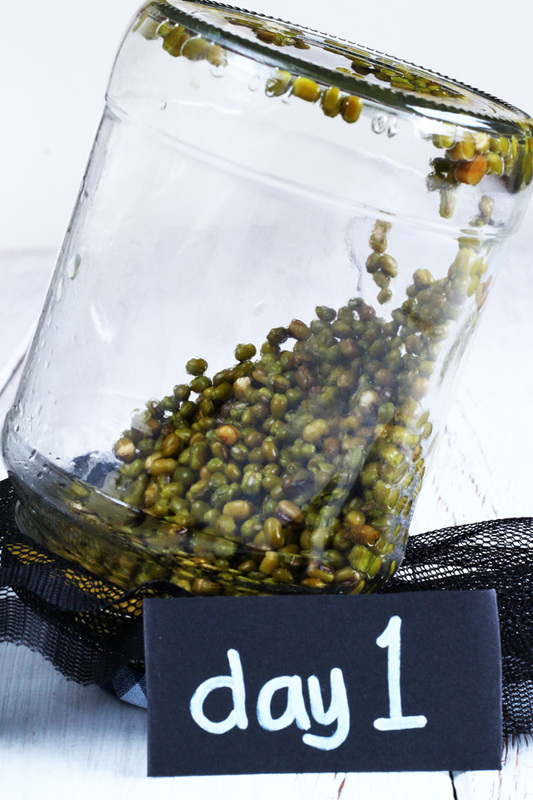 Place the sprouts in a basin and fill it with water. Some of the hulls will float while some you have to remove on your own (or not). 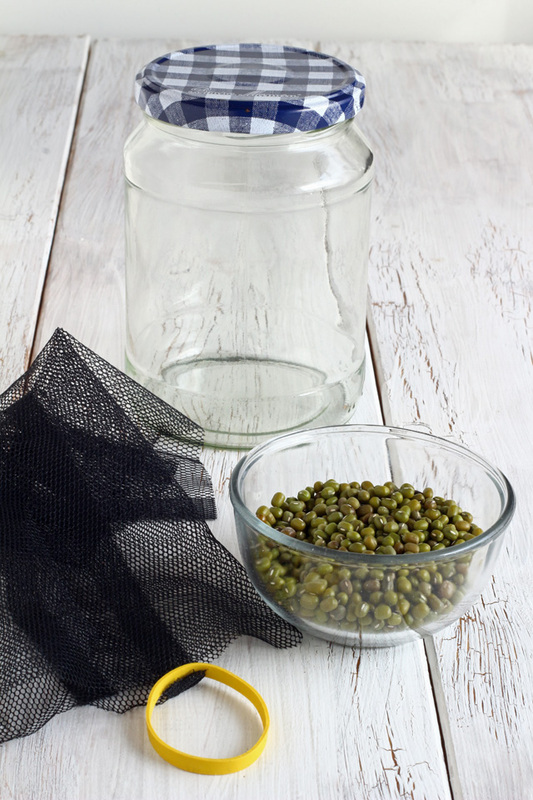 Transfer to a colander and let it drain fro several minutes before placing them in the fridge for storing for some days. You are welcome, Roxanne! 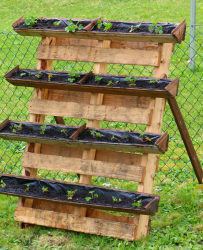 And you can do the same with other beans or seeds… have fun! 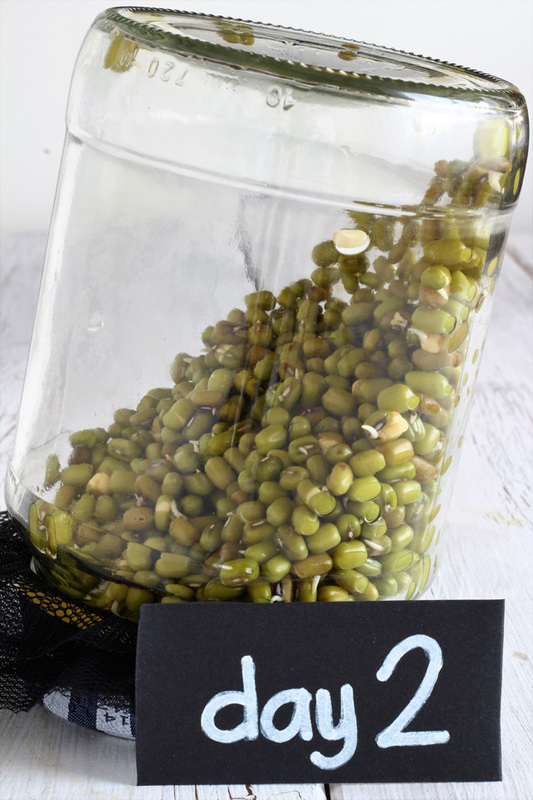 How and where do you buy your mung beans? Do you buy them semi-fresh or are they dried like red and black beans so that you can buy them in bulk? I would imagine if you don’t want to drive 30km to get the sprouts, you probably wouldn’t want to drive that far each time you need the beans too. There are cakes and other stuff you can make without a mixer. And if you have the patience and the will and the muscles, a whisk can also work :-).